Home tanning Leather making at home, or Home tanning, takes a considerable amount of time, patience, and hard work, but it is very rewarding. A good place to start is with smaller animals, such as squirrel, raccoon or rabbit, and then move up to larger game. 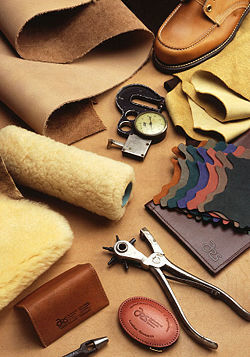 Tanning is the chemical process used to treat animal hides, making leather from the skin. The tanning process involves preparation, the actual tanning and last, finishing the surface. This method of tanning involves leaving the hair intact on the pelt, and gives you a soft, workable hide that can be used for decoration, a wall hanging, or used in a sewing project. The first step in the process is salting the fresh skin. Fresh hides taken from the animal should be cooled immediately. All flesh and fat should be scraped away. Put the skin in the shade, and if possible, on a cold concrete surface. Lay it flat, fur side down. Once the skin feels cool, cover it completely with three to five pounds of plain, uniodized salt (for a larger animal). Move the flat, salted skin to a safe place, away from animals. As the skin dries, it will become "crispy". The skin is stable and ready for Home tanning. Tanning the hide is next. This amount of tanning solution will tan five rabbit skins or two large skins. You'll need: 3½ gallons of water, 8 cups pickling or plain salt (don't use iodized), 1 pound of bran flakes, two 30-gallon plastic trash containers, a long wooden stick for stirring, 1¾ cups battery acid (get this from an auto parts store), 1 box of baking soda, a wood rack, neat's-foot oil, some nails, and a wire brush. Soak the dried skin in fresh water until it's flexible Pour one and a half gallons of boiled water over the bran flakes. Allow the mixture to sit for one hour. Strain out the bran flakes; keep the brownish solution. Boil the last half of the water. Put all of the salt into one trash container. Pour the boiled water over the salt and stir until the salt dissolves. Add the brown liquid and stir. Wearing gloves and an old long-sleeved shirt carefully add the battery acid to the mix once the solution is lukewarm and stir. Add the skin to the solution, stir, and let it soak for about 40 minutes. Stir occasionally. Fill the second can with lukewarm water. Transfer the skin to the lukewarm water for rinsing. If the finished skin will come into contact with human skin, add baking soda to the water and allow it to soak for a few minutes. Otherwise, take the skin out of the rinse water and hang it over a board to drain.